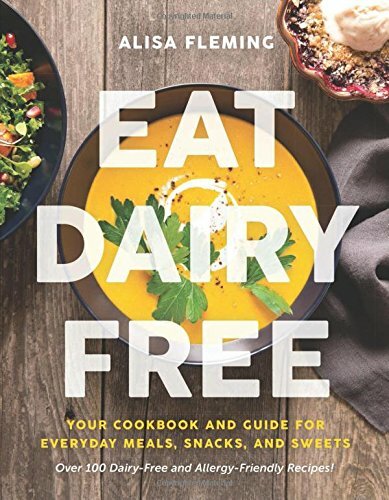 Eat Dairy Free: Your Cookbook and Guide For Everyday Meals, Snacks, and Sweets is an amazing new release from Alisa Fleming of Go Dairy Free, the leading online dairy-free resource. I'm honored to provide you with a review of this amazing cookbook; as well as share a sneak-peek of Alisa's Pan-Fried Paprika Potatoes and the FULL recipe for Alisa's 1 -Minute Milk Beverage -- all from the book! I've been following Alisa of Go Dairy Free on Pinterest for quite some time. Her amazing recipes frequently pop up when I'm searching for something fun and new to make for my family. So, when I was given the opportunity to check out this beautiful new cookbook by Alisa, I most certainly could not pass it up. . . Upon opening this gorgeous book I found myself pleasantly surprised by all that I found! Alisa takes you from sharing her own personal journey to covering basic dairy-free pantry staples & nutritional information and onto an amazing resource of dairy-free recipes. All 110 recipes are, or have tested options for: gluten-free, egg-free, peanut-free, AND soy-free! Back it all up with some incredible photography and fun variations offered with each recipe, and you have one extraordinary dairy-free journey in the form of one super drool-worthy book. How delicious do these sound?! Now, my family loves their potatoes. We eat them every which way pretty frequently. But when I saw Alisa's method for making pan-fried potatoes, I knew I just had to give it a whirl. The result? Little cubes of flavorful potatoes that are perfectly crisp on the outside and pillowy in the middle. I'm sold! I will never pan-fry my potatoes any other way again. And as you can see below, my little one couldn't resist! That's a win in my book. Thank you, Alisa. Want a sneak-peek inside?? Why not try this easy, healthy, and delicious recipe . . . There is only one dairy alternative that I frequently use in everyday recipes, so I would be remiss if I didn’t offer a homemade option. 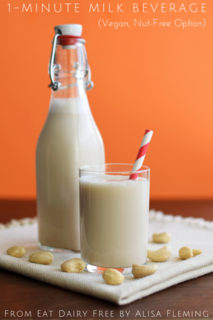 Because dairy-free milk beverage is so inexpensive and easy to find, I do often purchase it, but I also make my own sometimes with this recipe. It works wonderfully in smoothies, atop cereal, or in the recipes throughout this cookbook. • Omega-3s: Grind up to 1 tablespoon of flax seeds with the nuts or grains. This recipe is reprinted with permissions from Eat Dairy Free: Your Essential Cookbook for Everyday Meals, Snacks, and Sweets by Alisa Fleming (BenBella Books, 2018). Photo by Alisa Fleming. Needless to say, whether you're just starting your dairy-free journey, or you're in need of some new dairy-free inspirtation, Eat Dairy Free offers something for everyone! I know that it will be one kitchen staple I return to again and again.